The Viet Cong were Vietnamese supporters of comunism, they fought against the South Vietnamese governement and the armed forces of the U.S. They were initially a small group that used guerrilla tactics to win there battles. But as the Vietnam war went on, they became a much bigger army, that not only used guerrilla tactics, but used conventional ways. 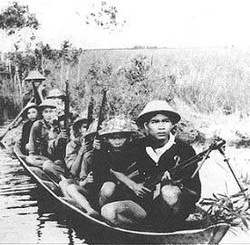 The Viet Cong were supported and trained by the North Vietnamese governement, but disbanded in 1976. During the war, the Viet Cong lived in secluded huts in the middle of the country side. These huts were connected by tunnels and trenches, and that was one of the advantages that they had over the americans: they knew the land. Also, the americans fought a conventional war, they had never faced anything like the Viet Cong, the Viet Cong hid in trees, they waited, and they attacked. It's alot like what the americans face today in Iraq and Afghanistan. If the Viet Cong fought a conventional war, the americans would have obliterated them, so they adapted. The conditions in the war were horrible, especially for the Americans. The Vietnamese were used to living in the jungle, the Americans, on the other hand, did not. Most of the Americans were from major cities, and had never faced the heat and jungles of Vietnam or any other country for that matter. The Amreicans had bad quality food, and most found it tough to sleep, during battles they were tired and hungry. They faced different dangerous animals like snakes and even tigers. The Vietnamese knew the land, the animals, and had better food. They used this to their advantage and won the war.